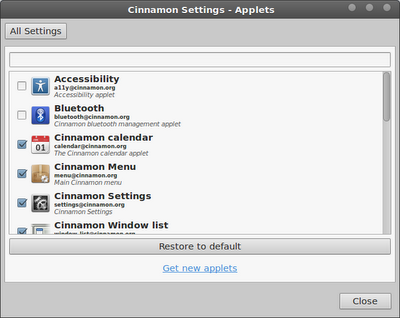 The Cinnamon version of Linux Mint also packs some nice features along with theme customisability. The window manager also comes with 'Applets' that will enhance your productivity whilst using Linux Mint. Applets are simple little programs that sit on your panel and provide a variety of features such as showing you to weather to showing you system information. 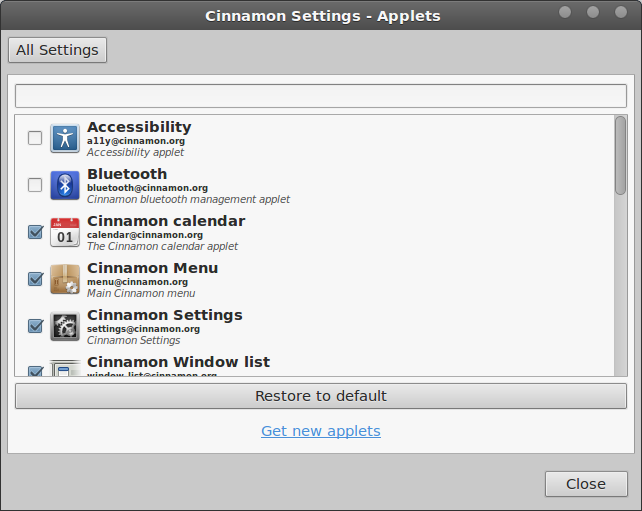 To enable/disable Applets, simply open up Cinnamon Settings and click the Applets option. Here you will see a list of Applets which you can enable or to disable by clicking the checkboxes. To reorganise the Applets on your panel, click the Panel Edit Mode option to 'On' in the Panel Settings drop-down menu on the panel (should be an arrow icon). You can install third-party Applets as well. The best place to find them is by heading over to the Cinnamon website under the 'Applets' page. Applets are a great way to customise your Linux system the way you want it to be. In addition to Applets are Extensions. These are slightly different and are not related to the panel. If you are a serious person then don't think of watching this anime. Danshi Koukousei no Nichijou is full of laughter, jokes, and stupidity. 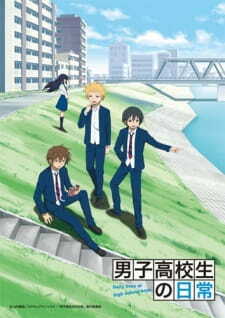 An anime about the everyday lives of high school boys. The anime may look boring at first but within the first ten minutes of the first episode and you'll already be on the floor laughing so hard. This anime is definitely must not be watched whilst eating or drinking since it will be highly likely that you will choke! It is that hilarious! Simply put, the anime is about the "everyday lives" of a few high school boys. I wouldn't say this is strictly slice of life but more of a comedy satire type. The episodes are divided into 2 - 7 minute segments like a many short comedy clips mashed into one. This however, manages to get the story moving along. Mostly though, these segments are unrelated to each other except for a few continuous segments such as "Literature Girl'. This was one anime that never bored me a single moment. It was random, funny, and absolutely well presented. The art was pretty good; with accurate details on characters and sceneries. The art was not the main point here, but it was suitable enough to complement the exaggerated facial expressions of the characters which made this anime that more hilarious to watch. The soundtrack was wonderfully chosen to be exactly how this anime's music should be. The theme songs were catchy and comedic. Most importantly, the 'Literature Girl' series always had this tune that made me laugh pretty hard. Those were just classical moments to play that tune. Moving on, the voice actors suited their roles perfectly between all the characters. This anime is all about the characters. This is the anime's main selling point. The boys are just hilariously presented given their varied personalities and their style of talking. The screen time is shared mainly between these three boys so we do not get a main character that monopolizes every single scene. The main character, Tadakuni, is your average type guy that always get bullied by his younger sister. He is always the center of jokes and pranks. The secondary characters are also hilarious, each of them playing right into a character stereotype but adding a sort of twist to it. Motoharu, the delinquent who's supposedly badass and mature, but still get's manipulated by older girls and is strangely deep and introspective, also having an above the average sensitivity and fragile spirit. Literature Girl, the mysterious silent girl who stands by the riverside staring into the horizon lost in thought, but she's actually just a naive wannabe novel author looking for an ideal encounter with a guy by the riverside. That is probably one of my favourite segments of the entire anime series. Overall, I totally enjoyed this anime! This anime is totally for those high school boys that just want to have a laugh at the fictitious representation of their lives. it is full of laughter, jokes and awkward moments. The everyday lives of these boys have never been so interestingly presented in an anime. Along with the wonderfully illustrated art work and accompanying soundtrack, this is one anime that you must watch. Guys will probably get it, I'm not too sure about girls though. Perhaps, the 'Funky High School Girls' ending segment on most episodes will keep you laughing till the end, even after the episode has ended. It is a "serious" comedic slice of life anime. Not much of a story but the lives of these boys is a story in itself. The art was pretty good; good details on characters and backgrounds. Soundtrack was nice and catchy. Voice acting was perfect for their characters. I loved all the characters, they just made my day. This anime will make you laugh so hard you might wet your pants. A thoroughly enjoyed this anime from start to finish. It was a perfect length; not too long not too short.